Mumbai Next for Anna Hazare? 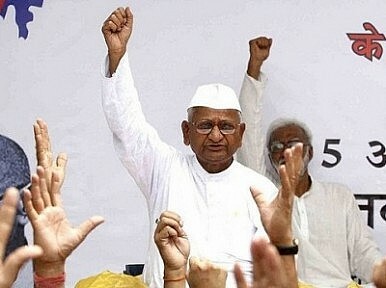 Activist Anna Hazare is set to announce the venue for his next fast. It’s another headache for the UPA. The United Progressive Alliance government’s biggest headache, the Lokpal (Ombudsman) Bill, is proving to be a political roller coaster of an issue as yet another Anna Hazare storm is set to gather from December 27. The 74-year-old Gandhian plans to launch a three-day agitation from December 27, with the venue to be announced. This time, Hazare is likely to make warm Mumbai the location, rather than freezing Delhi. The cabinet of Prime Minister Manmohan Singh approved the final draft of the Lokpal bill on December 20 amid indications that the UPA government intends to fast-track the tabling of the bill in Parliament and have it approved this week to blunt Hazare’s agitation. The winter session has been extended until December 29 to pass the bill. Shortly afterward, upset MP’s cut across party lines to pressure the government to finish up with the legislation within the next several days. Many don’t want to return from their constituencies’ in between Christmas and New Year. The government has been secretive about the broad contours of the draft Lokpal bill. The prime minister has taken strong exception to leakage of government bills to the media before they are tabled in parliament, and has told his cabinet colleagues to ensure complete secrecy. The Business Advisory Committee has set aside 16 hours for debate on the Lokpal bill in the Lok Sabha whenever the government finally moves the bill. Regardless of Singh’s gag order, key details have still trickled out. For example, the prime minister will finally be under the ambit of the Lokpal, as will be the 5.7 million central government employees, though with certain safeguards. This should placate Team Anna to some extent. But what will undoubtedly enrage Hazare and company is the government’s reported decision to keep the Central Bureau of Investigation out of the Lokpal’s purview. One interesting complication for the government is over the involvement of the main opposition Bhartiya Janata Party in advising over the drafting of the bill. Critics warn that the BJP, which believes it can capitalize from Hazare’s agitation, is keen that the bill isn’t vigorous enough to take the steam out of his agitation. Anna Hazare a Hindutva Project? This week’s assembly polls laid bare the weaknesses of the anti-corruption campaign. And its likely real goal.